Landscape drainage is essential, especially around buildings that are constructed in areas of expansive clay soils. This is particularly common in the Dallas metropolitan area. In the absence of a French Drain system, moisture can build up during the wet season and can trigger clay soil to expand. This expansion can lift a home or building’s foundation. A French drain has one function, to carry underground water away from a foundation. Using a French drain, you can effectively prevent an accumulation of underground water, as well as deal with stagnant or slow-moving water on the surface of the lawn. To get the best results from your French drain, the slope should be well designed from the start. A French drain installation needs to be done correctly in order to work. To start, a French drain system consists of two ends: the drain field and the drain exit. The drain field, also known as the high end is the entry point for excess groundwater; it should be lower than the bottom of the perimeter beam of the foundation. The drain exit is where the water is discharged from the system. 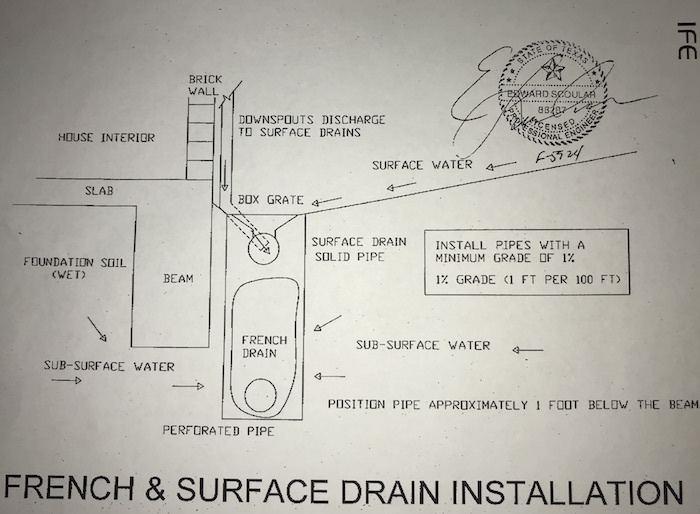 French drains enable water to easily flow through a channel into a trench filled with gravel and finally into a perforated pipe at the bottom of the trench. This way, water can travel freely through the pipe and empty at a safe distance from your house. The bottom of the trench should be aligned and sloped in the direction you wish the water to flow. Water can be diverted to different places depending on your circumstances. Some of the most common places you can empty your water include; a drainage ditch, dry well, a low-lying section of your property or the street. A French drain comes in handy when you’re having challenges with surface water. You should consider installing a French drain if you have a soggy lawn or a washed-out driveway. Additionally, if you intend to build a retaining wall to sit on a hillside, a French drain will solve your problems. What Challenges Can a French Drain Solve? A French drain should not be confused with or made to act as a surface drain. Surface drains have surface water collection boxes. These boxed are spaced every 8 to 10 feet in low lying areas around the foundation. Surface drains tend to collect both water and surface trash. They also need periodic flushing with a garden hose. A surface drain will have a solid pipe buried 10-15 inches connecting the various drainage boxes. It is not perforated because the perforations would allow the accumulation of subsurface water. It is not uncommon to have both a surface drainage system and a French drain installed in the same area. The surface drain is also often connected to gutter downspouts. When building a retaining wall, it is recommended to include a French drain right after the first course of blocks or stones. Failure to do this means water pouring downhill and accumulating behind the wall. This damages the structure. The pipe should sit on the same concrete footing that provides support for the wall. To prevent the drain from becoming clogged with silt, a landscape cloth should be put across the base and up the slope. This should be done before the drain gravel and pipe is added. The wall should also have pipes at proper intervals to relieve the water pressure. To get the best results from a French drain, it’s important to select the most appropriate location on your property for the drain exit. The aim is to ensure water is moved away from your foundation, house and wet yards to a drier and safer area. A grassy slope that receives plenty of direct sunshine for most of the day. The grass is ideal for absorbing moisture while the sun boosts evaporation. A suitable area near your problem area in order to reduce the length of the drain which saves you costs. Empty water on the street as your excess water can be carried away by the municipal sewer system. Before doing this, first, confirm with your local building department to see whether doing this is allowed. Where water could end up on a driveway or sidewalk and turn into ice during winter. Some houses have rain gutters already installed which empty water into an underground drainage system that is linked to a municipal drain. 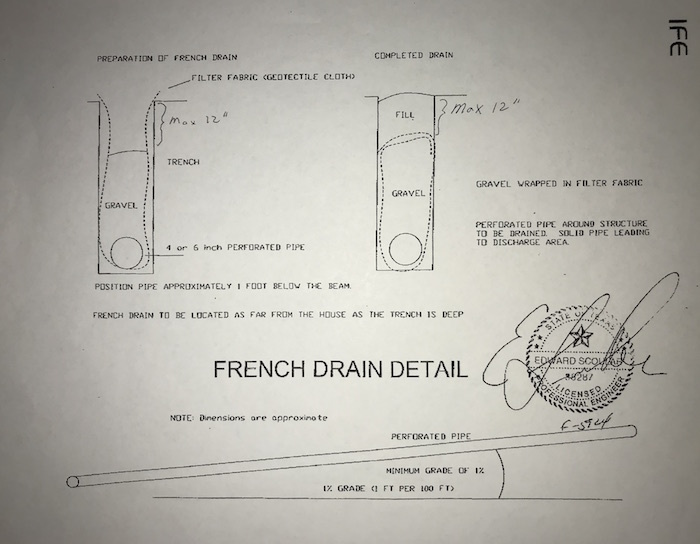 In this case, a French drain can be connected to the already existing drain line, provided that the French drain is higher than the drain pipe. In the event you’re unable to find a safe and ideal spot for your system to drain, the remaining alternative would be to empty your runoff into a dry well. A dry well consists of a vertical hole that is filled with gravel. It allows excess water to be taken in by the surrounding soils. Often times these are fitted with a sump pump to lift the water and expel it to the street. To cut down on costs, French drain designs should be routed around utilities to avoid distorting previously installed utility systems which are an expensive undertaking. To have an effective French drain system, it’s advisable to seek the services of a reputable, company. With a professional taking charge, you can be assured all drainage performance will be adequately taken care of and the French drain installation will be carried out well.